One of GenerEOS missions is to educate the public about the benefits of EOSIO-based blockchains and how to build amazing dApps on top of them. As part of this mission we are currently approaching universities to give lectures and workshops of varying technical depth and detail to cater for students with different levels of blockchain and programming related knowledge. 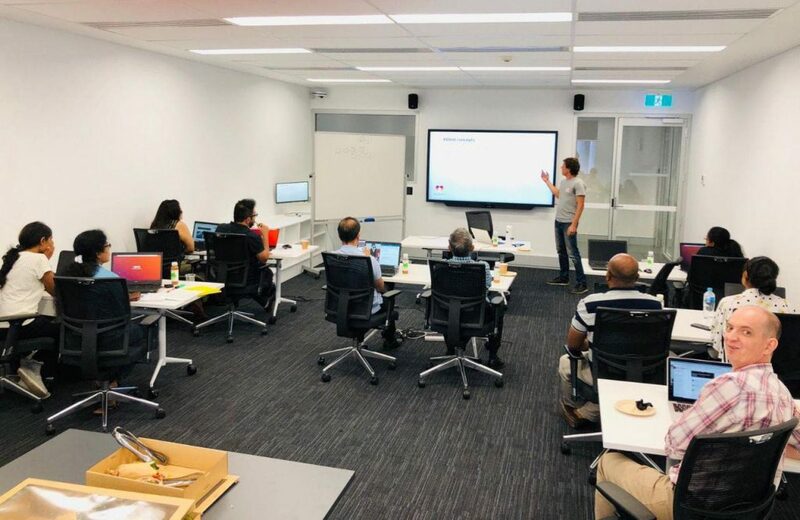 This week we have held our first EOSIO Smart Contract development workshop for PhD students at the University of Western Sydney, Australia (UWS). 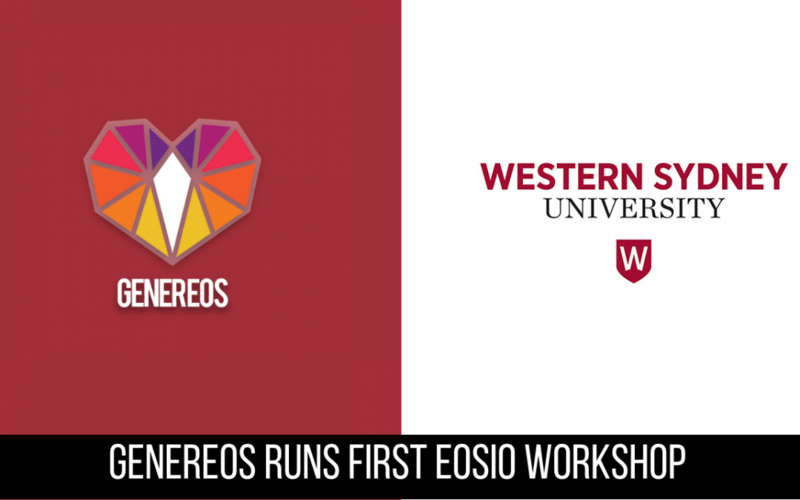 After an initial discussion organised by Tom Fu from GenerEOS with Associate Professor Dongmo Zhang, Director HDR from the School of Computing, Engineering and Mathematics (SCEM) WSU, the faculty expressed great interest in providing a more in depth and hands on experience of the EOSIO Blockchain and engaged GenerEOS to provide a workshop on Smart Contracts development to their students. Ralf Weinand, our new CTO has done a great deal for Team GenerEOS and has meticulously put together a very detailed series of workshops that dive into the EOSIO Blockchain and Smart Contract Development. “The first workshop was held at WSU for PhD Students School of Computing, Engineering and Mathematics. Prof Srinath Perera, Director of the Centre of Smart Modern Construction (c4SMC) who leads several Blockchain Projects at WSU also participated in the workshop. The PhD students are researching the use of blockchain for various topics – from supply chain management to smart construction to sustainability among other areas of application. We started by reviewing blockchain basics and discussed advantages and disadvantages of various consensus mechanisms. We then explored DPoS in more detail. I then explained the EOSIO specific concepts relevant for smart contract development, the EOSIO required components and how to install, configure and use them. We also took a further look into using command line tools to create wallets, keys, and accounts. We then implemented, compiled and deployed smart contacts and I explained how to execute those via command line. To wrap it all up and to give a teaser for the next workshop we reviewed and discussed some more advanced smart contracts. At conclusion of the workshop Professor Srinath Perera commented, “Ralf conducted the workshop extremely well and we are delighted to understand the greater flexibility and application potential of ESOIO as a Blockchain platform for sectors such as construction, manufacturing and agriculture. The Centre for Smart Modern Construction is currently carrying out several research projects in order to establish Blockchains for several areas of construction industry applications.”. “The EOS workshop was a great opportunity to get hands-on experience on a real blockchain development with backend tools. The flow of the workshop is well arranged, and resource person Ralf gave a really good insight into developing smart contracts on blockchain networks. As a PhD candidate would like to thanks both Western Sydney University and GenerEOS for arranging such a valuable workshop”. “The workshop was effective for me, as it gave me a great opportunity to learn EOSIO Blockchain and its application. In particular, I got interest in the development and deployment of smart contracts which gave me a fantastic experience. I am more interested in future workshops to get more hands on experience on the development of Distributed Ledger Platforms where my research is focused on. Thank you very much Ralf for a valuable knowledge sharing workshop”. “In my opinion, the workshop was a great success as it was a rewarding opportunity to get hands-on experience on a real blockchain and especially on the back-end infrastructure development related to EOS. I’m looking forward to another workshop to learn more and more. Thank you Ralf for sharing your expertise with us”. GenerEOS and the University of Western Sydney were extremely excited after wrapping up our first workshop of the series. We are looking forward to many more to come. We also welcome any other University, College or Enterprise in Australia or Internationally to contact us at contact@3.87.34.8 to learn more about EOSIO.